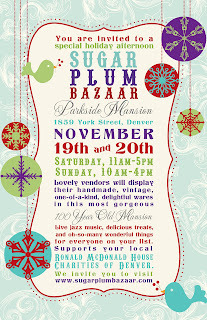 Over 40 of the BEST market vendors in Colorado will be at the Sugar Plum Bazaar next weekend, Parkside Mansion, 1859 York St. FREE admission, GORGEOUS 100 year old mansion, festive atmosphere, coffee truck, goodies to nibble, and seriously the best collection of artisans and retailers of any holiday show this season! Our CHARITY this year is Ronald McDonald House - this wonderful organization provides a warm, friendly, caring home for families traveling to Denver for their children's medical treatment. This care helps these families who need the assistance tremendously. 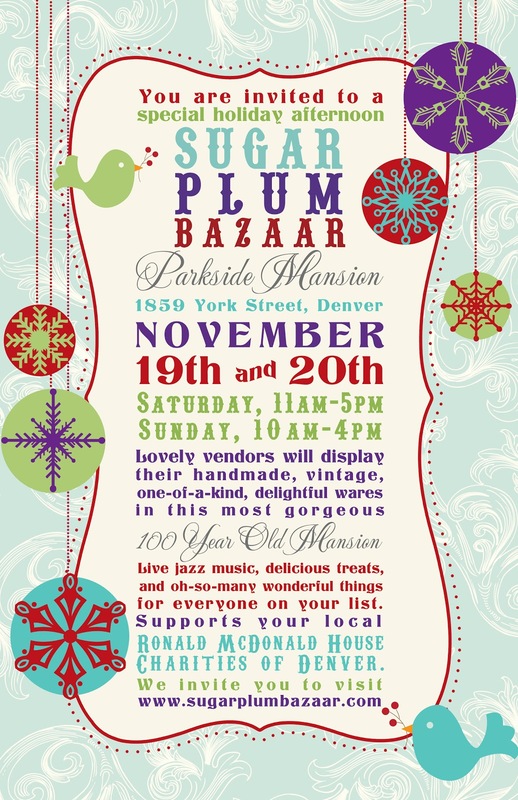 If you can, please make a small donation to RMDH upon entering this wonderful event. We welcome the delightful sounds of Danny Showers on piano during the day Saturday! Saturday, 11-5pm, Sunday, 10-4pm. Free parking at East HS - corner of 17th and York.